Pick one or pick them all, get your Sponsors and do it wherever you like: on-road, off-road, a Parkrun*, the open sea or in a pool. The choice is yours! TRI A LITTLE OR TRI THE LOT! BUT MOST IMPORTANTLY, TRI! Promoting engagement and networking opportunities with the Members, the Sponsored 'Pick and Mix of Sport' is open to all HCA Members and their friends and family. Of the 1.2 million staff in the NHS, it is likely that around 300,000 would be classified as obese and a further 400,000 as overweight. So this year, reinforcing the HCA 2017 L&D Forum's focus on the health and well being of NHS employees, to tempt all our HCA Members into taking part in our Sponsored Charity 'Pick and Mix of Sport' event, we are offering lots more choice for your 'fitter future'. 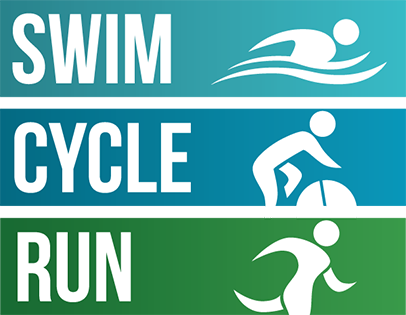 You can either Swim, Cycle, or Run... or indeed do them all! Or for the more experienced swimmer, the whole 750m in open sea! A 25 mile 'cycle' ride. A balance between effort and ability where we have 'set the bar!' (excuse the pun) based on the 2016 Forum Cycle Challenge where a number of our Members managed 25 miles. "I have no bike", some of you may cry. But fear not! Around the UK there are leisure centres and health clubs all offering Spin Classes – and 2 good classes would be an acceptable alternative. 5 kilometres. No special equipment required here... Get the trainers on and sign up for the 5K of your choice. No events near you...? Should that be the case, look up your local Parkrun* who offer free weekly runs in over 400 locations throughout the UK. Just follow the link for details of how to sign up. Take this opportunity to get bitten by the Northern Ireland 'fitness bug', while supporting your HCA Forum Charity Challenge 2017.